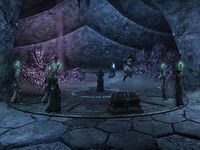 Foolkillers Clan is a Daedric clan of Dremora in service to Molag Bal. The clan is based in Coldharbour. The Foolkillers were once betrayed by Deathbringer Clan, who then rose to prominence in Coldharbour. The vestiges of the clan were trapped within a set of armor by a Grievous Twilight named Dusk. A Foolkiller named Lyranth somehow avoided that fate, and swore vengeance upon the Deathbringers. However, she was banished from Coldharbour and was unable to fulfil her oath until 2E 582. After defeating Dusk and freeing her clanmates, Lyranth returned to Coldharbour and allied herself with an invasion force from Tamriel, who had come to the realm to end Molag Bal's attempted Planemeld. In return for slaying the Deathbringer leader Valkynaz Seris, Lyranth gave the army access to the Endless Stair. With his death, the Foolkillers returned to Coldharbour and took control of the Pyramid for themselves. For game-specific information, see the ESO article. This page was last modified on 21 October 2018, at 08:12.